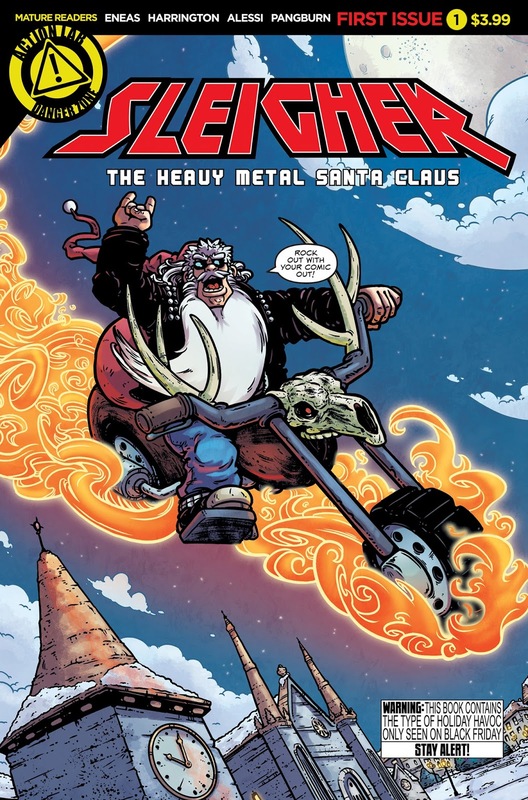 The Fellowship was fortunate enough to obtain a copy of SLEIGHER: THE HEAVY METAL SANTA CLAUS #1 from Action Lab Comics. Rob Harrington and Adam Horrigan write, Axur Eneas draws, Alessandro Alessi colors and Chas! Pangburn letters. The man they call Sleigher may be new on the scene, but he’s already making enemies in a big hurry. He’s got a very different style from his father, but he knows how to put the hurt on the bad guys, be they handsy priests or demons from Hell. But Christmas Eve is tomorrow, and the big guy is going to get a big surprise from someone who’s been waiting a long time for this. Irreverent barely begins to describe this book (“Rock out with your comic out” is right on the cover). This is one badass Santa, and he’s right about the first Motörhead album. Also, a cameo by Putin himself – what’s up with that? A metal Santa with a heart of gold is a cool new idea, and the art works really well, even with all of those wild (and nicely detailed) crowd scenes. This is totally the kind of Christmas story I can get behind. Break out your Metal Xmas album and shred through this book today – it’s okay, you don’t have to wait until December. SLEIGHER: THE HEAVY METAL SANTA CLAUS #1 is available now at your FLCS or at actionlabcomics.com.